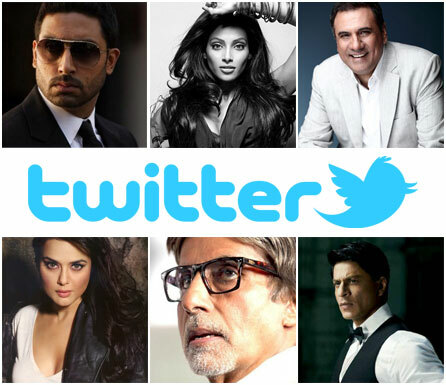 Once again, the Bollywood Twittersphere has been abuzz as it has been the primary medium for breaking news in 2011. Some of the headlining stories have been the birth of “Beti B” to Abhishek Bachchan and Aishwarya Rai-Bachchan and the passing of two Bollywood’s veteran actors, Shammi Kapoor and very recently, Dev Anand. So let’s take a look at who has made this years Bollyspice Top Bollywood Tweeters for 2011. Typically known for his comedic roles on screen, Anupam Kher takes his followers on his travels around the world. Always tweeting with a smiley face, Kher is one of the more positive tweeters and encourages a healthy outlook on life. He has a good interaction with his followers and often wears his heart on his sleeve. In between his travels, he also finds time to write regular columns and has recently released his first book, “The Best Thing About You is You”. This bombshell beauty’s tweets are mostly about health, fitness, fashion and beauty. She tries her best to promote a healthy lifestyle and offers her own useful tips to her followers. Basu tweets fondly to and about her co-stars and replies to her fans when she is able to. This Bollywood tweeter is someone most people would want to have at their dinner party. His tweets are entertaining, sharp and witty and often include glimpes into his family life. The recent milestone in Irani’s personal life was his son’s wedding. During this auspicious occasion, he kept his followers up to date about the event, including who was on the celebrity guestlist! Many followers, even industry film folk eagerly partake in his “Chai Garam Chai” film quizzes. Zinta’s personality is reflected strongly in her tweets and comes across as vibrant and loveable. She often starts discussions on various lifestyle topics which many respond to. The actress often retweets (RT) many of her replies and shares what her followers have to say. Keeping his spot on our Top Bollywood Tweeters, Shah Rukh Khan continues to prove that he still holds the title of King Khan. Whether he is jetting off to London or rubbing shoulders with Lady Gaga, SRK is as witty and endearing as he has been since joining the Bollywood Twitterati. What probably wins many people’s hearts is his open affection for his family. Affectionately known as “Piggy Chops”, this busy actress still finds the time to interact with her many followers. When she has a free moment between shoots, she also replies individual tweets. Tweeting from different locations, this actress loves her music and is also known to throw questions about various topics to her fans – who respond enthusiastically. If there’s one Bollywood tweeter who is not afraid to express her emotions openly, it is none other than Sonam Kapoor. This actress uses Twitter as a medium to vent and let’s all her frustrations known. At times, she responds to some tweets – even the negative ones! Eloquent tweets from this actor keeps Amitabh Bachchan on our Top Ten list. Always on point about current affairs, he is evidently a family man. He tweets about his family, latest film shoots and continues retweeting particular tweets about important issues. Arguably the Mr Cool of The Bollywood Twitterati, Abhishek Bachchan tweets as if he is chatting to his buddies. Whether he’s supporting his favourite football team, listening to music, or more recently talking about the new love of his life – Beti B, Abhishek certainly comes across as warm, friendly and humourous.